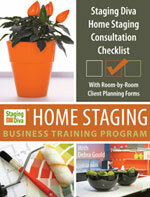 Attention Australia Staging Diva Graduates, I have a home staging project for you in Victoria, Australia. The home seller is currently living in the United States but is ready to sell her St. Kilda apartment. I’ve written many articles on why vacant homes don’t sell as well, so I’m glad this home seller recognizes the importance of adding furniture before putting it on the real estate market. In fact, she may have a friend staying in the apartment while it’s on the market, so you’ll need to make sure you’re adding a real bed in the bedroom. For the right home stager, this would be a great way to build your home staging portfolio. And since you’ll be dealing with your client long distance, I recommend you follow the pricing and payment strategies I outlined in Course 3 of the Staging Diva Home Staging Business Training Program. The apartment will be listed for approximately $460,000. Apply for this St. Kilda, Victoria home staging job couldn’t be easier. Simply complete the form at the Staging Diva Home Staging Project Referral Service. Please be sure to include “St. Kilda, Victoria Home Staging Job” as the project location in the first line of the form. This St. Kilda, Victoria home staging job will be referred first to members of the Staging Diva Directory of Home Stagers for free. In other words, there will be no referral fee for Directory members even though we’re playing “match maker” for you. If you get any paid work through this referral (and you’re not already a Staging Diva Directory of Home Stagers member), there will be a $125 referral fee, which you can build into your home staging consultation fees. It’s entirely up to you. Remember this is a one-time fee (only if you get paid work from this referral). If you receive future home staging projects from the client or her agent, or she refers you to other friends or real estate agents, there is no additional fee. In other words, you have nothing to lose applying for this position if you’re in the St. Kilda, Victoria area, and everything to gain! Please note, if you do not follow the instructions to apply for this home staging job, you will not be considered. Are Home Staging Clients Able to Find You? If you’re not already a Staging Diva Graduate consider that just one good project would more than pay for your entire training program plus building and hosting your web page on the high-traffic Staging Diva Directory of Home Stagers for an entire year! Unless you have more home staging projects than you can handle, what are you waiting for? Get the training and marketing you need to ensure the steady growth of your home staging business. Staging and marketing expert Debra Gould operates the only home staging job board in the world and has a network of over 10,000 Staging Diva students in 23 countries. Come and join us!